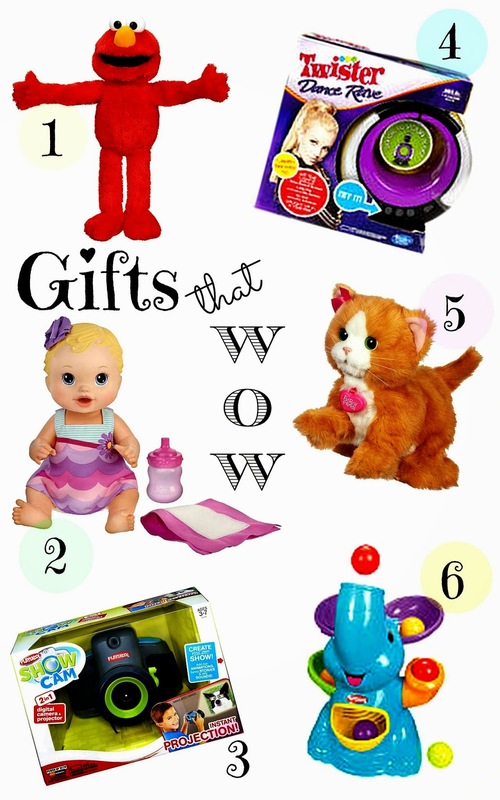 Gift Guide: 6 Babe Gifts That Wow! You are here: Home / Babe / Gift Guide: 6 Babe Gifts That Wow! Whoa….these six toys are pretty much amazing and likely to make your tot’s face light up with pure joy and excitement. From Elmo to Baby Alive and a little Twister in between you can’t go wrong with giving these awesome toys as gifts this holiday season. Playskool and Hasbro are notorious for creating toys that enable your child to learn through play. We love that Playskool and Hasbro both embrace the philosophy that toys and playtime are essential to your babes growth and development– and this goes for all ages! You must check out the Elefun Busy Ball Popper, named toy of the year in 2012, still a HOT item on wish lists this year and patiently waiting under our tree to be opened by our toddler. Loving the FurReal Friends- Daisy Plays With Me Kitty, the cutest of toys that cuddles and plays like a real kitten, even down to the purring! Adoring a new twist to the Original Baby Alive, Baby Alive Bitsy Burpsy Baby Doll. Our toddler is obsessed with giving her baby a bottle and listening to her burp just like a real baby! She feels like a little mommy and loves to check and change her diaper too. Check out the rest of our Playskool and Hasbro favorites and go go go, time is a ticking. Happy Tot Shopping!